All my lovers should cooperate to make Myrtle Beach the spiritual abode for one and all. Following are some of the opportunities available to those who wish to help ensure that Meher Spiritual Center remains “a place of pilgrimage for all time” dedicated to the life and work of Avatar Meher Baba. Meher Spiritual Center, Inc. is a 501(c)(3) charitable non-profit organization; donations are tax-deductible as allowed by law. Meher Center receives essential support from its many volunteers, currently numbering over 300, who lovingly contribute their time, labor and expertise in numerous capacities, ranging from legal counseling to raking paths and making tea. To inquire about the opportunities for volunteer service and/or to offer your particular expertise, please call the Meher Center Administrative Office at 843-272-8793. Meher Spiritual Center Associate Membership is open to all, is entirely voluntary, and does not confer any special benefits. The annual dues of $10 per person for non-locals, $20 per person for locals, helps to support the operating budget, and memberships are an important demonstration of the broad-based public support necessary to maintain the Center’s non-profit, charitable organization status. Myrtle Beach, SC 29572 , U.S.A. The growing number of individuals who pledge monthly gifts to Meher Center are an important source of dependable income providing the Center with the necessary funds to meet ongoing expenses. Monthly pledges can be made by credit or debit card through PayPal by clicking the DONATE button above or can be fulfilled by check made out to Meher Spiritual Center, Inc. and mailed to the address above. An automatic monthly donation pledge can be made by clicking the linked PDF form then printing and filling it out and mailing it to the Meher Spiritual Center. 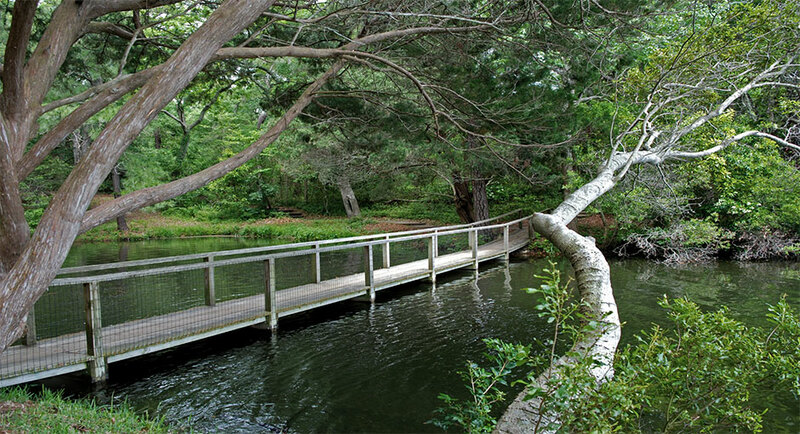 The footbridge across the lagoon. Our Planned Giving link (left column) briefly outlines some of the many opportunities available to those who may wish to help ensure the future of Meher Spiritual Center by remembering Center in their estate planning. Consultation with a Meher Center representative to discuss estate planning options and the Center’s long-term needs may be arranged by calling the dministrative office, (843) 272-8793. As we cannot provide tax or legal advice, you are advised to consult with your legal advisor, tax advisor, or professional estate planner to determine which Planned Giving options are best suited to your individual situation.